When I was visiting Dad in Ohio, I spent a lot of time sitting on the porch swing that Dad had put on the patio. He had it all set up for me to be able to photograph the birds and wildlife. I had a blast watching the different species of birds, chipmunks, and the gray, black, and red squirrels. I took many photos and had many giggles at the various antics of the critters. Good thing I took so many photos then, because I haven't taken any since I've been back!!! Yes, that was weeks ago! We've had such extreme, hot temperatures that it's miserable to be outside. Gosh, I never thought I'd hear myself say that! We're also experiencing a drought, and our crops and animals are suffering. I hope that Mother Nature decides to open up the faucets and give us a little relief soon. So, for now, I must use the photos from my trip and hope that I get some new photos soon. Many people think squirrels are annoying. I think they're cute--and your shadowy photo proves my contention! Sounds like a lovely time! 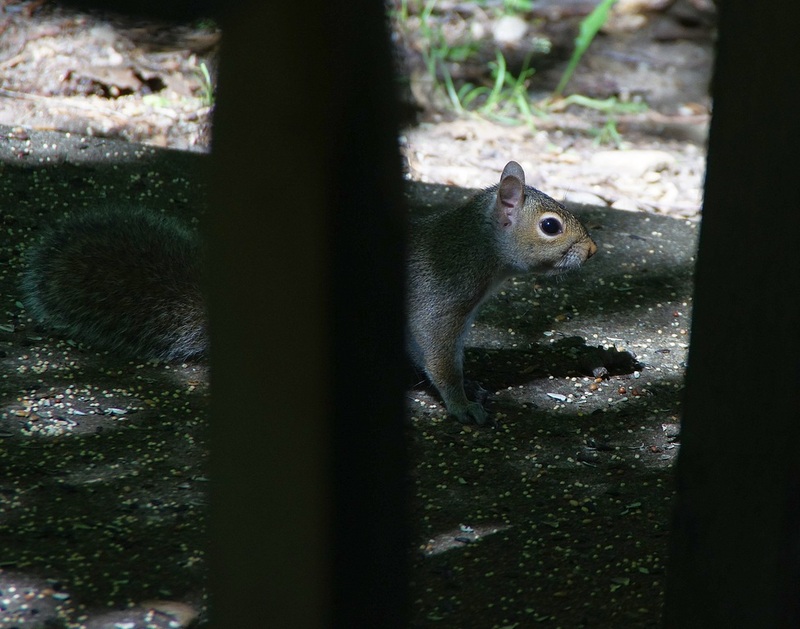 I'm rather ambivalent about squirrels...I can live without them, yet sometimes their antics amuse me! You got a good close-up of the critter! So wish I could whisk some of our torrential winter rains your way! We have had plenty on the Mornington Peninsula! Adore your little squirrel! Such a cute one! he gave you a nice shadow shot opportunity!!!! I enjoy squirrels' antics, although they can cause a lot of damage. I'll swap you some of our wet weather, for some of your heat! !